I've mentioned before that I keep a craft "to do" list. 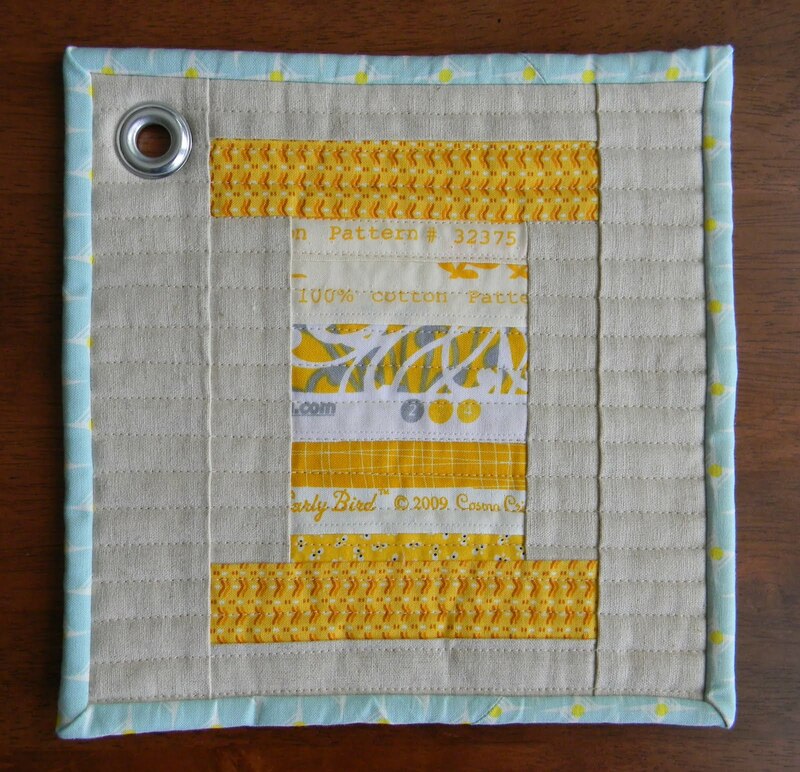 It helps me keep track of the quilts and projects I hope to make. I find there are many times, however, when I have a sudden desire to make something specific (that isn't on the list) which has popped into my head. I feel a compulsion to make whatever it is right now. Is that weird? 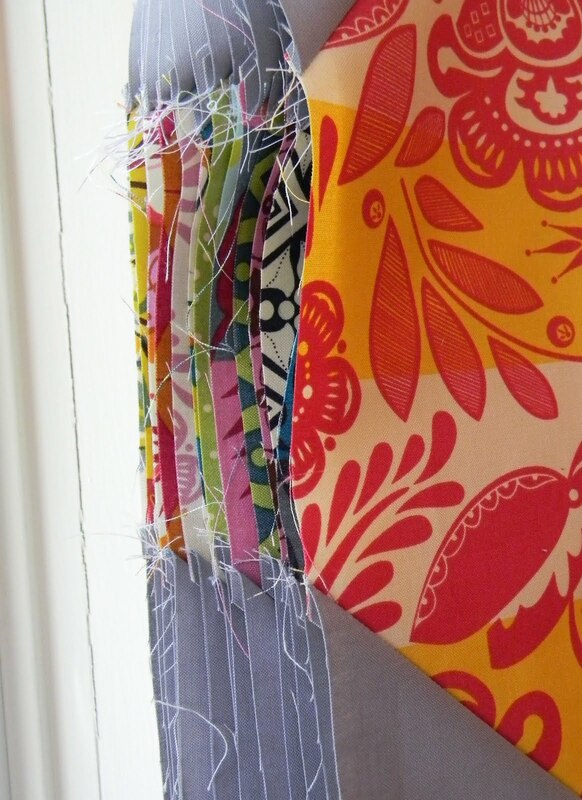 I'm finishing up the binding on the latest such project. 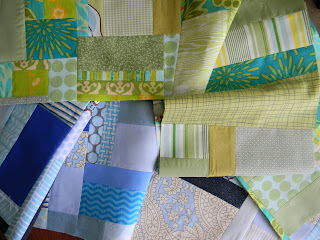 Then I can get back on track with my Good Folks quilt. 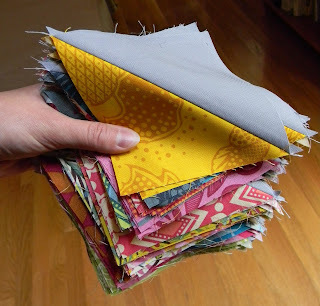 Oh, and I need to bind my scrap rainbow too, unless, of course, I need to make a few variations of this latest obsession to get it out of my system. That may be the case - it's really fun. More tomorrow. 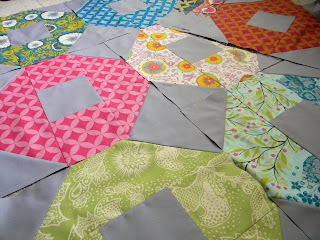 96 bonus HST blocks and all 24 modified shoo fly blocks done! 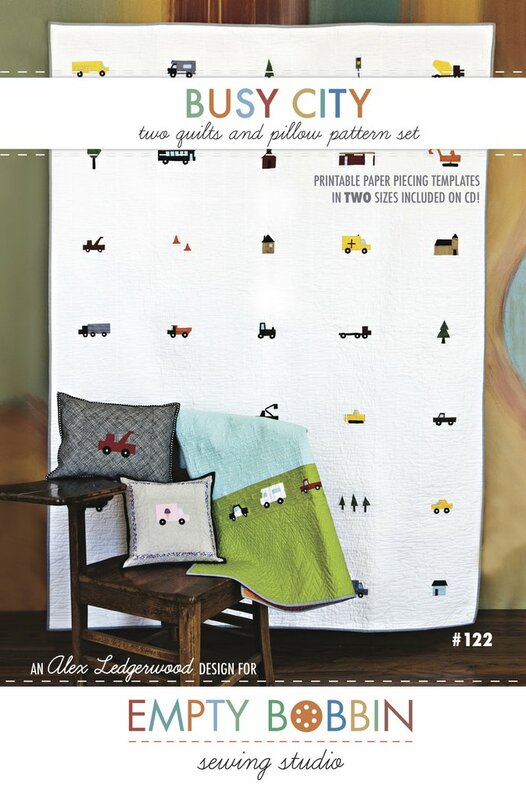 I guess it's time to start piecing a couple of quilt tops. This Father's Day, I asked my husband what he would like, and so he actually got something he really wanted. 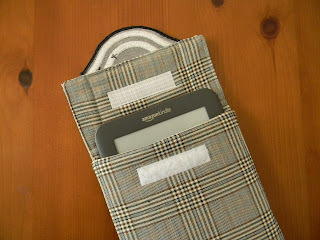 I made sure to get a little handmade goodness in there too though with this kindle cover. 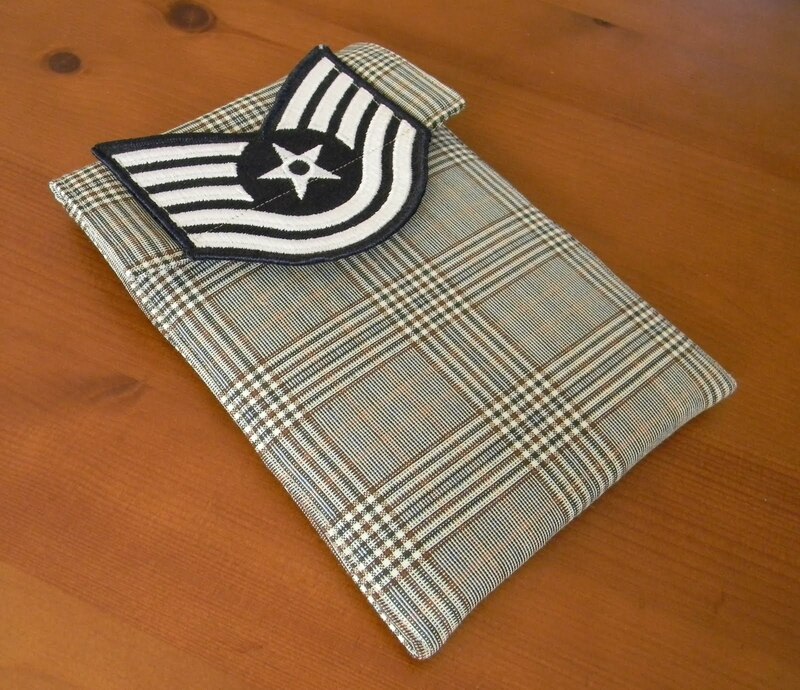 The inspiration, and awesome suiting material and badge, came from Lauren of Aunt June fame. Thanks friend - you are the best (did you know if she really likes you, she will even help you strip wallpaper?). 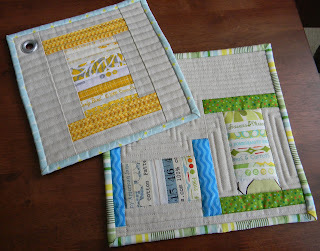 I have made twelve modified shoo fly blocks from my prized Good Folks collection. 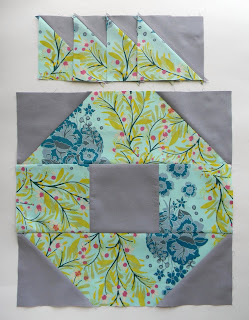 I'm halfway through my fat quarter set, and I've paired them with Kona medium gray. 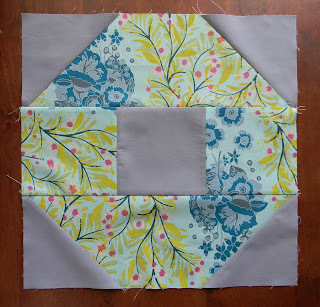 I'm making four blocks at a time, which works well for me. And this is my pretty stack of bonus HST blocks! Contrary to what my most recent posts would suggest, I'm not much of one to go in for crafty swaps. But when it's my guild or a fantastic gal like Amy, who can say no? 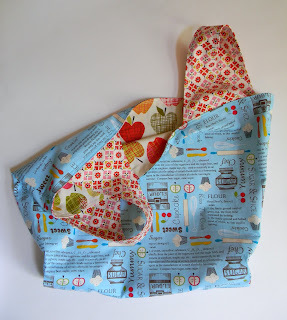 Amy has hosted a number of swaps called Potholder Pass on flickr, and when she invited me to join, I saw there was an option to make reusable grocery sacks. This is so much cuter than the store bought ones, right? 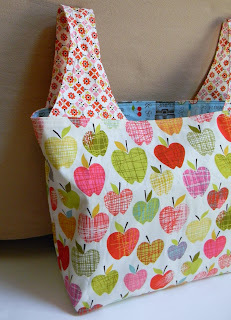 The pattern is by Keyka Lou, and it makes a great size. It is also reversible. I found all three fabrics at Joann's, believe it or not. Next time I try it, I'll use home dec weight fabric and interface the handles. Now I just need to stuff this bag with some extras and send it off to my secret swap partner. Last night, the KCMQG had a chef swap. 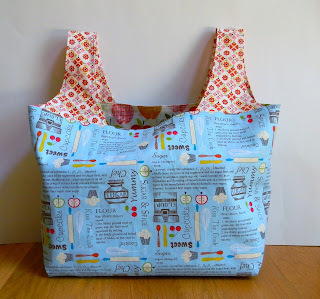 We each drew a bag of scraps from another member a while ago, and the challenge was to make something for that person's kitchen. I made these items for Dawn. 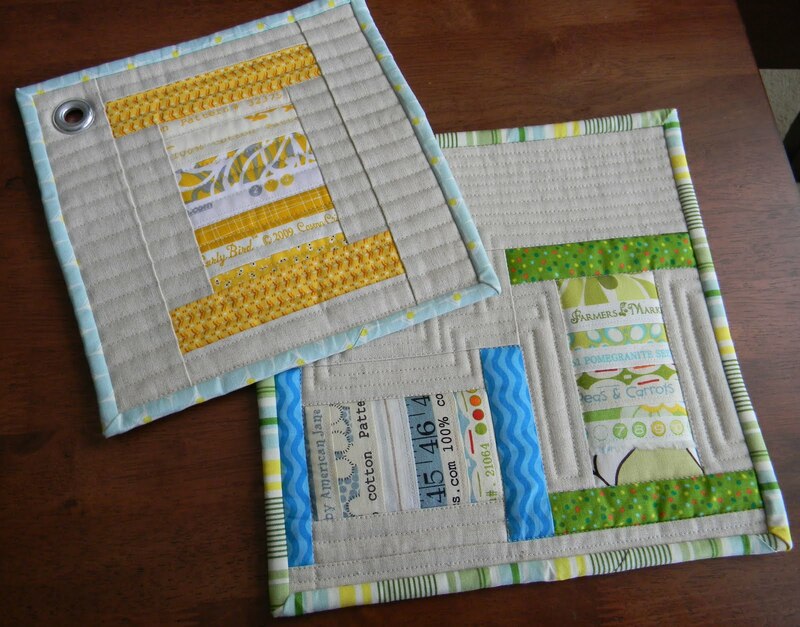 The trivet and potholder are made from Essex cotton/linen, Dawn's fabric and selvages. You can find Jacquie's spool block tutorial here. She also has a tute on putting in grommets. Thanks Jacquie! 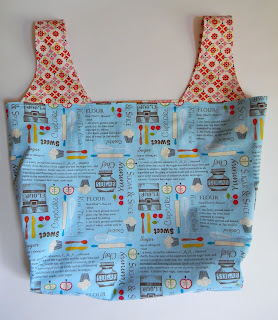 I made another reversible apron out of some Nicey Jane to round out my swap items. I hope they'll get lots of use! 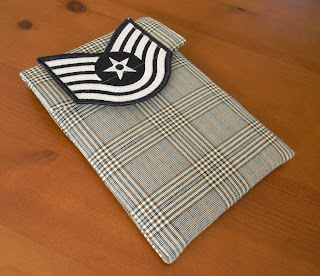 Also, if you're looking for the FD Pouch Instructions, I've added a link to my sidebar. So far the guild has made over 70! You can find out more information on the guild blog, as well. 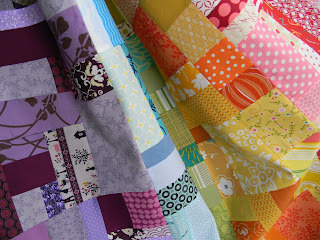 My scrap rainbow is all together. 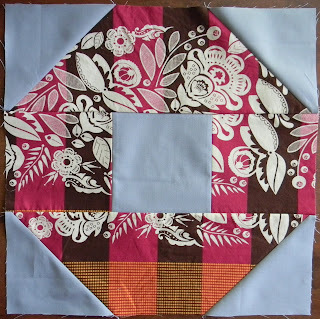 I find this type of improv piecing so relaxing. Choose. Sew. Press. Trim. Repeat. Now to find the right backing. I've made this block 15 inches, finished size, to show off larger scale prints. Each enlarged block makes a bold, modern statement. 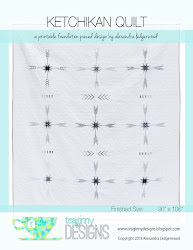 The idea of a large shoo fly as a modern spin on tradition is not mine though - Malka Dubrawsky created a 35 inch block! The tutorial for that giant is here. 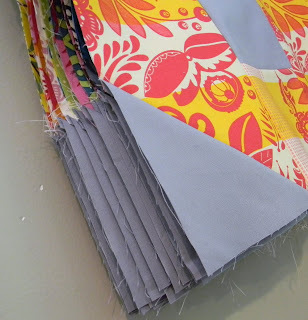 It requires a whole yard of fabric! 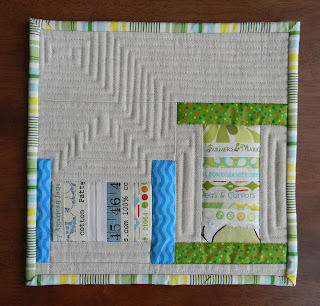 I designed my block to use fat quarters. I think it will be the perfect way to use my Good Folks fat quarter bundle, allowing each print to shine on its own, while still showcasing the whole collection. 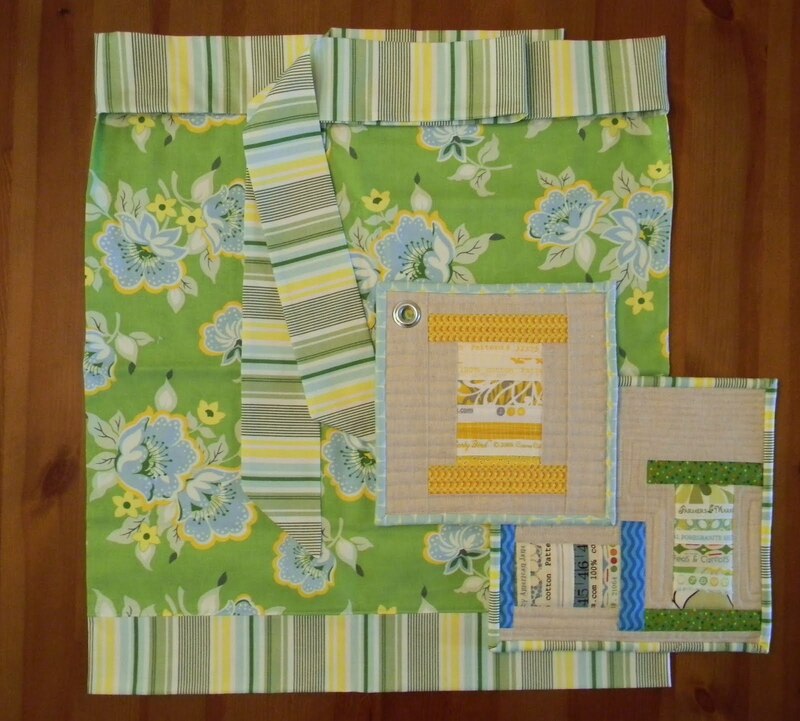 And my twist - I modified the traditional pattern to use four fewer pieces and save myself four seams on each block! 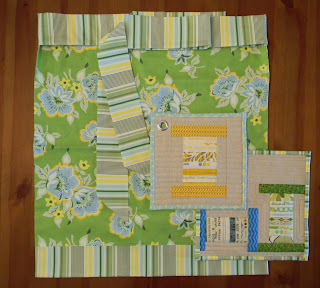 Instead of using squares and half square triangles (HST), my version uses two large rectangles along with squares. 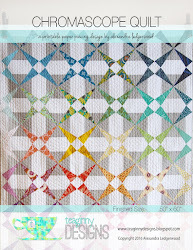 I make the triangles with the stitch and flip method. And there's a bonus of four HST at the end! I've found just the right use for my Good Folks collection. I wanted something that would feature the large scale florals and let each individual print sing. This is a variation on the shoo fly block. 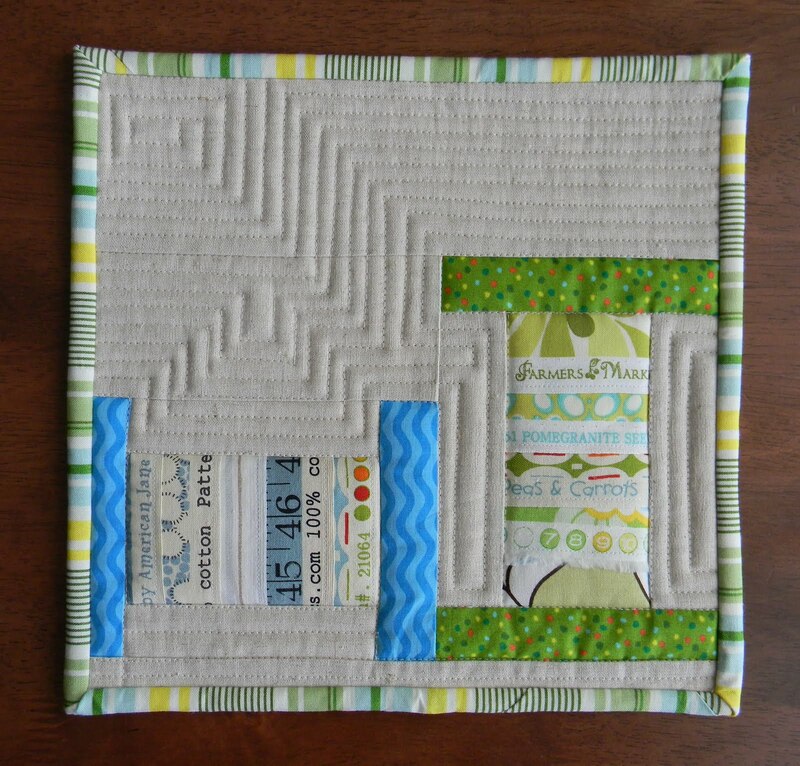 I've put my own little spin on this traditional block. Back soon with a mini tutorial! My solids for a couple of upcoming projects have arrived, but now I'm interested to see how my scrap rainbow will turn out. 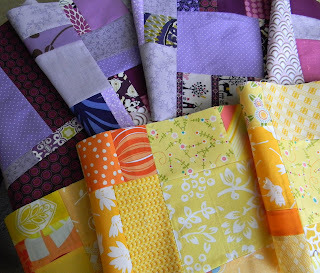 Here are the yellow/orange and purple. Just red/pink to go. And maybe black/grey. I'm trying to decide if I'll leave them as long strips, as Jolene did, or make them into smaller units with some type of sashing. 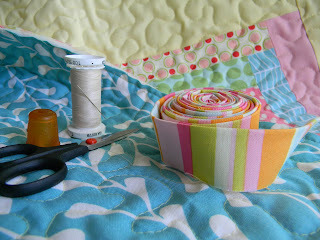 I'm waiting for some solids to arrive so I can start a couple of new quilts. 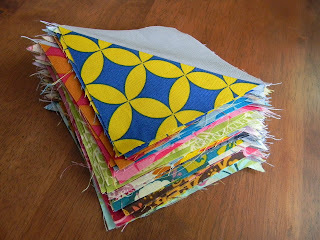 While I wait, I'm trying to tame my scrap bins with an improv project inspired by Blue Elephant Stitches. I've got blue and green so far.